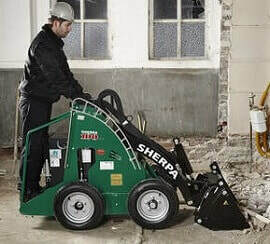 The Sherpa mini skid steer is compact, multi-functional and extremely manoeuvrable. Our versatile mini skid steer can push, load, dig, excavate and drill thanks to its many attachments. The Mini Skid Steer offers multiple advantages for landscapers and builders over other loaders thanks to its reduced size and attachments. The small mini skid steer only needs the man power of one operator, reducing labour costs and improving efficiency on the job site. Suitable for equestrian, farming, landscaping, gardening, construction and demolition applications, the mini skid steer is a multi-purpose machine. Being compact, the mini skid steer will work in tight spots where previously, due to space restrictions, loading, unloading, digging, filling and excavating, would have been done manually. ​The mini skid steer can access the inside of buildings, areas between houses built close together and backyard gates and fences, making this mini loader the perfect alternative to a large excavator for tasks such as digging under structures where overhead clearance is limited. We offer a mini skid steer range with petrol or diesel fuel options for convenience of use. Mini skid steer attachments such as augers, hydraulic breakers, forks, buckets and more are available to tailor specific requirements. The mini skid steer 100 AGRI is a compact and extremely manoeuvrable machine, perfect for the farming and equestrian sectors. 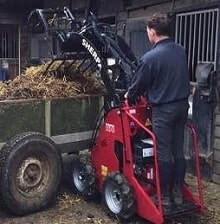 Riding schools, cowsheds and farmers can use this multi-functional mini skid steer loaders for many different jobs such as mucking out stables and transporting soil, straw or feed. This efficient mini skid steer model is only 76 cm wide which makes it suitable for access to tight and narrow areas and because of its manoeuvrability it will reduce the work load considerably, making the otherwise heavy tasks, more enjoyable. Being a compact, small machine, this mini skid steer will work well in very tight and narrow areas when previously the work could only have been carried out manually. 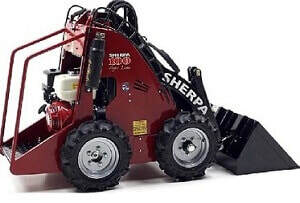 The mini skid steer 100 petrol is the standard machine with a GX630 V Honda 21HP engine. Made from strong, quality components, the petrol run mini skid steer gives an excellent work performance. The mini skid steer diesel models have hydraulic lifting power and other features that makes them easy to use and maintain. This mini skid steer has a drive system powered through a gear pump which transfers the oil onto the machine through a 5-fold control unit for different applications. 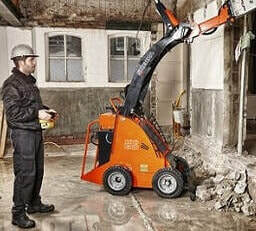 The electric mini skid steer ECO is just a powerful as the petrol or diesel mini skid steer models but it is best suited for indoor demolition work and enclosed areas such as stables and offices. This compact 76-cm wide mini skid steer is powered by a surprisingly strong 2-HP front-mounted electric motor. By increasing acceleration, the pressure in the system quickly builds up. The space normally allocated for the fuel now stores a 360-Ampere battery pack that powers the mini skid steer for up to 7 hours. With an easy battery change system, the workload of these loaders can be extended without having to recharge. Suitable uses for this mini skid steer include internal demolition projects and work in confined spaces thanks to its minimum exhaust fumes, lack of engine noise and narrow proportions. This mini skid steer has revolutionised the construction and building sectors, where safety in the workplace now more than ever is paramount. The mini skid steer 100 EHD are state-of-the-art machines that fulfill specific and important requirements in today's market such as the lack of vibration, emissions, pollution and noise. 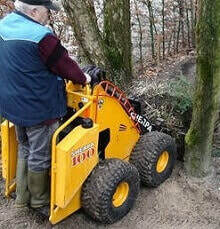 This electric mini skid steer is radio controlled for safety but it can be switched to manual operation if required. 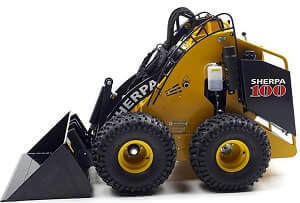 The electric mini skid steer is fully computer controlled so that the speed/power ratio is optimally applied and as little energy as possible is lost. The functions go through a microprocessor that uses the PLC principle (programmable logic controller) for lasting battery power. 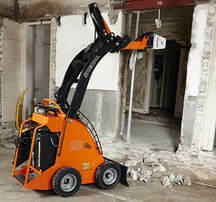 As well as being environmentally-friendly, this mini skid steer will reduce body strain and has exceptional features that will allow uninterrupted renovation and demolition work in areas such as offices and hospitals. 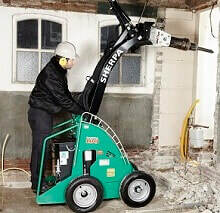 A supplied mini skid steer attachment extension enables you to carry out demolition work up to a height of 3 metres. 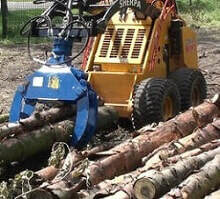 These machines are fitted with a reinforced heavy duty frame to protect the hose and coupling. A strong, powerful electric motor and 100% rubber tyres give optimal power and stability for indoor work. An easy change system allows for easy replacement of the 360-amp battery. 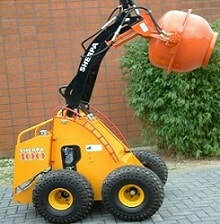 This mini skid steer can be fitted with a 220-volt connector if working at a fixed location. Lawn and Garden: Use the mini skid steer for tasks such as clearing and levelling the ground for planting, removing trees and shrubs, digging holes, placing and removing concrete tiles, paving projects and more. 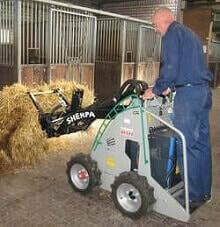 Equestrian: These mini skid steer loaders are perfect for riding schools, cowsheds and jobs such as mucking out stables and for carrying and transporting manure, straw or feed. Landscaping: Clear, level and grade areas for paving or applying concrete or asphalt to walkways or driveways with a mini skid steer. Farming: These mini skid steer loaders will haul soil, fertiliser, feed and other materials. 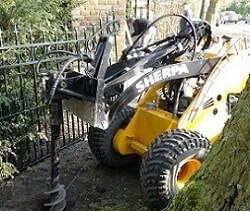 The mini skid steer has attachments which are very useful for setting fence posts. Excess water from the farm can be quickly removed and discarded with our mini skid steer. Construction: Building materials can be moved with the mini skid steer to and around the work site and any rubble and debris transported and disposed of safely. Demolition: The compact mini skid steer is essential in demolition projects for easily and safely removing, transporting and unloading debris.